Beadstrology™ is a creative way to combine the art of astrology with the craft of beading. In the process of stringing Beadstrology™ designs, you’ll come to understand your birth chart better — as your planets, signs, and houses literally take shape in your hands. Your finished pieces will look like a map of the heavens at the moment of your birth, as seen from the exact location of your birth. With Beadstrology™ tutorials, you can make a 24-inch Beadstrology™ necklace or a Beadstrology™ bookmark in an hour or two. The instructions are simple enough for beginning beaders — and the results are sophisticated enough for any beading enthusiast. Beadstrology™ tutorials are PDF documents, delivered electronically, so you can get started immediately. For ordering information, click here. 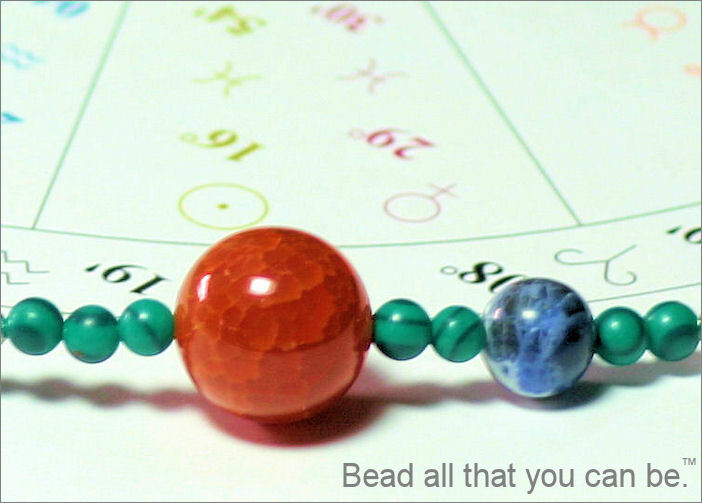 You’ll need a printed copy of your birth chart to make Beadstrology™ designs. Click here if you’d like to order a birth chart or a comprehensive astrological report. Beadstrology™ designs and tutorials were developed and written by Corrine Kenner, the author of Crystals for Beginners. is there a difference between your birth chart and others that are offered on the web? Now that most birth charts are computerized, the information in them is basically the same. Some programs do a better job than others at displaying that information. Some look cleaner than others, especially when it comes to the symbols and typefaces they display. It’s really just a matter of personal preference. You can see the difference between two types of birth charts on this page: https://beadstrology.wordpress.com/tips-hints/.